The Test Box | March / Gee Whiskers! As mentioned yesterday, I received a March The Test Box subscription box and today I am going to share the contents with you. The first box is part one of the two part unveiling of the subscription service. I covered a lot of the detail about the subscription service in my post yesterday so I am going to jump straight into the post. A subscription costs R160 a month (which includes delivery), I included the information of the products sent to me by The Test Box as I haven't properly tested all of the products yet. Joico K-PAK Shampoo to repair damage (100ml value R120) A gentle, rich cleansing shampoo that restores weak and depleted hair to its optimal strength and condition Joico K-Pak Shampoo to Repair Damage replenishes amino acids and fills in damaged areas of the cuticle while hydrating and protecting with aloe and antioxidant Vitamin E. Your hair will become stronger and more resilient to external damage. Plus, because what’s been missing is being replenished, your hair will be more responsive to styling. pH 4.5-5.5. Joico K-PAK Conditioner for damage (100ml value R125) This daily conditioner delivers the precise amount of daily conditioning that damaged, chemically treated hair needs. Joico K-Pak Conditioner to Repair Damage reconstructs and smoothes hair with K-PAK’s Bio-Advanced Peptide and Keratin Silicone complexes. Your hair will be moisturised and stronger with increased silkiness, shine, movement and bounce — all without tangles or static. Double Dipped Detangler (value R45) Beyond being the best named product this is one of the test boxes baby loves not only is it super cute looking but it is an amazing wide tooth comb which we use to combat teasing, Rupunzel type ladies and also with our younger ladies who just don't like brushing. This is the one time double dipping is ok. Wink. 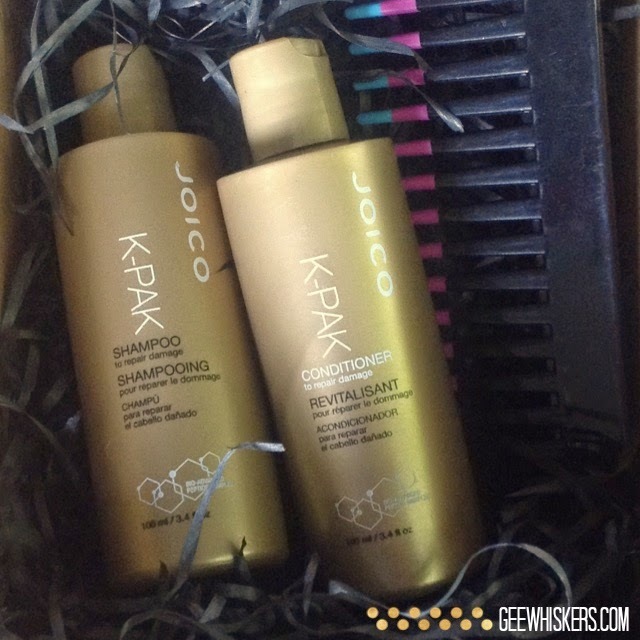 I have tried Joico K-PAK shampoo and conditioner for dry hair. It really did have a good impact on the condition of my hair. I look forward to seeing the results of these two products. I have been using the double dipped detangler since receiving the box. It works well especially when working the conditioner through my hair in the shower. Although R160 seems a bit steep for a monthly subscription box, the thing to remember is that you will not be receiving little sachets or tiny tubes of products in each box. The box is valued at R360 when you take delivery into account. I look forward to seeing what the other monthly boxes will contain and am definitely considering subscribing to a few boxes to properly test out the service. The Test Box | March. Visit @thetestboxza to place your subscription. I am currently giving away a 3 Month Subscription to The Test Box - click here to enter now. PS. Current subscribers for March will receive their boxes this week. When they sign up for the April box, they will have the opportunity to add part 1 to their subscription - making the April box a real bumper box for subscribers! If you are not currently a subscriber, any surplus supply will be available for purchase however we have been told by The Test Box team that stock will be very limited. Haven't tried anything from this brand before, looks great..